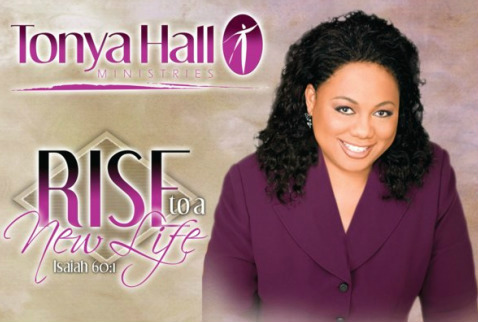 Tonya S. Hall is an internationally-renowned evangelist, prophet, teacher and conference speaker who demonstrates the power and discernment of the Holy Spirit through the dynamic prophetic mantle on her life. She submitted her life to the call of the Lord at the age of fourteen engaging in hours of prayer and intercession. During these formative and influential years the Lord began to deposit his power, wisdom and compassion into her life to become a voice to the tormented, afflicted, desperate and discouraged. Prophetess Hall resigned as a highly-esteemed educator for eleven years to serve as the Executive Director of Juanita Bynum Ministries, Inc for ten years. While supporting this multi-million dollar ministry, God greatly increased her prophetic anointing and launched her to minister in mega-churches and international platforms all over the world while committing not to abandon smaller more modest congregations. Her acclaimed humility, servant hood and intercession had such a profound impact on others, it inspired her insightful, prominent, and well-known DVD series “Faithful in Another Man’s Work”, “Nothing Can Stop You Now”, “Come On Through”, and “Divine Release” to name a few, as the foundation for Kingdom citizenship. With a bachelor’s degree at Georgia Southern University, influence with world-renowned Pastors, Government Ambassadors, Civil Servants, and Diplomatic Leaders, Prophetess Hall believes her greatest accomplishments pertain to being a good mother, friend, mentor, Kingdom life coach, empowerment facilitator, and a well-balanced Servant of God. Her passionate desire to serve the Lord by provoking, engaging and equipping the body of Christ through a leading-edge prophetic message will invoke a revolution of change in your spirit to command the manifestation of Gods power to stimulate the divine Kingdom inheritance secured by the Word of God. Affectionately known as “Pastor T”, she serves alongside her parents, Bishop and Dr. Swinson, as the Pastor of Victory Way Christian Center in Jacksonville, FL.